For a few weeks I started to improve my guitar skills, mainly using a very nice app called Guitar Speed Trainer. I enjoy practicing with this program very much, and I felt that my speed improved just in a week since I started using it, so I recommend this for all guitar players who are not so quick yet to play those fast licks. There are numerous simple (and not so simple), but tricky guitar tabs you have to play at varying speeds, first starting at a low pace, then faster and faster, and at a moderate speed at the end. This improves speed practicing greatly because after the fastest peak you will be able to play at moderate speed better than before. The speed curve (you can see it on the left of the screenshot) can be modified for your taste, and if you want, you can compose your own practicing guitar tabs with the built-in editor. 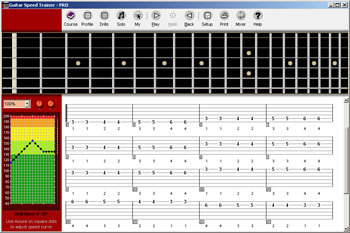 There is a knowledge base section in the program, with lots of theory and information about how you can improve your skills and how to maximize the effectiveness of practicing with Guitar Speed Trainer.